A. Select a product. Put the Quantity. And then click [Buy Now]. B. Click [Continue shopping] and select another product if you would like to buy more. Click [Empty] if you wouldn’t like to purchase all selected products. Review the quantity, products, prices, and shipping cost. If it is correct, then click [Check Out]. We provide Registered Air Mail via Thailand Post Office. 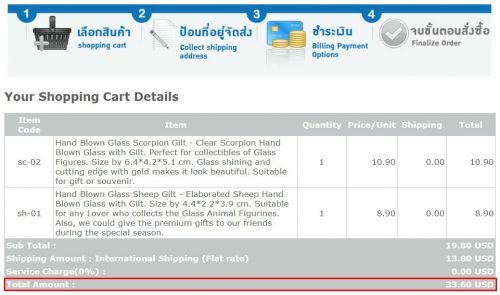 It is the International Shipping Flat Rate (the same price for every country) and the tracking number is provided for tracing at http://track.thailandpost.co.th/trackinternet/Default.aspx?lang=en. Please see Policy and Shipping for more information. C. Fill in your information for shipping address. 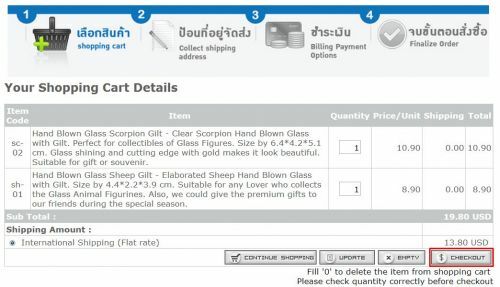 Click [Check Box] if the billing address is the same as the shipping address. Choose the payment method: [Credit cards or other online services (e.g. Paypal)] and then click [Paypal.com]. Then click [Submit]. For “Direct Transfer money via Banks” it is a method for residents in Thailand Only. D. Review all information (prices, quantity, and address). Then click [Select]. 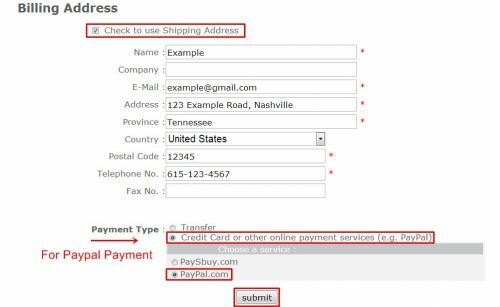 E. On Paypal’s Payment Page, [Log in] to your Paypal account to complete the purchase. If you do not have a Paypal account, select "Check out as a Guest" OR "Pay with my credit or debit card". Then fill out the required information to complete the purchase. 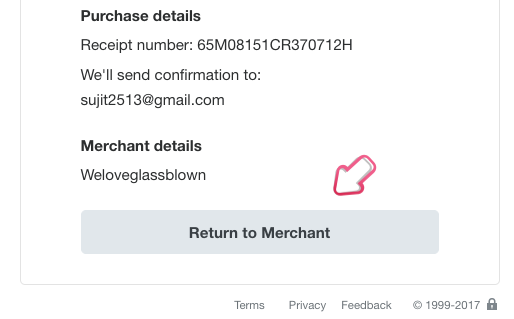 F. After the payment is made completely, please click [Return to Merchant]. Then you will be back to Weloveglassblown website at the Page of “Finished Order”. 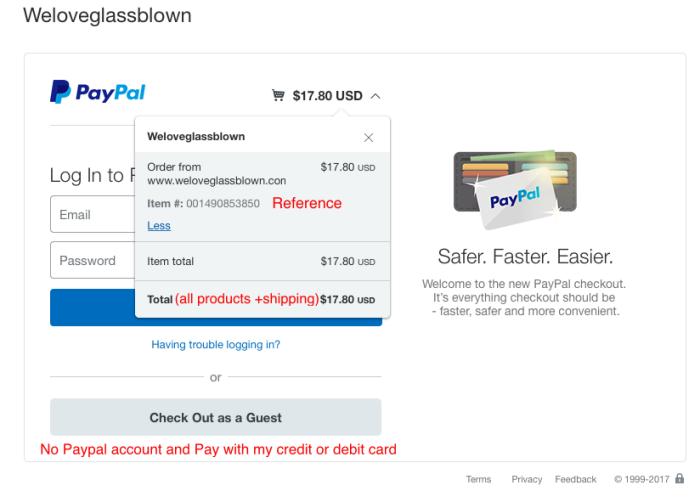 A buyer will receive one email from Paypal (reference for payment). G. Order is finished as the Page showing below. 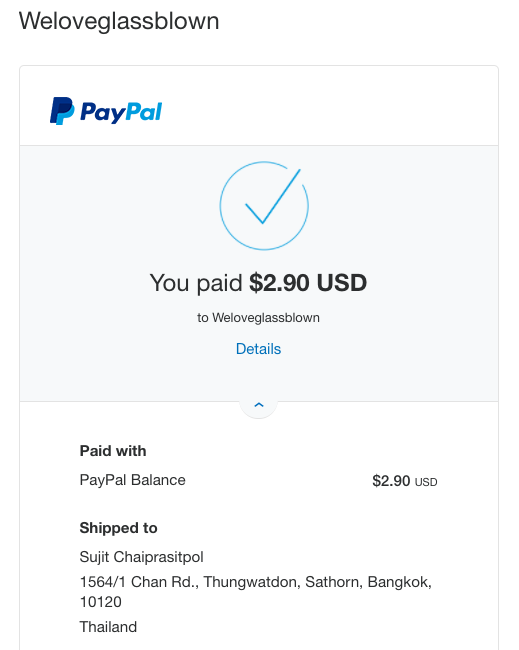 A buyer will receive an email from our store of Weloveglassblown that informs all details (order number, all bought products’ details including pricing, shipping fee, and the total amount). 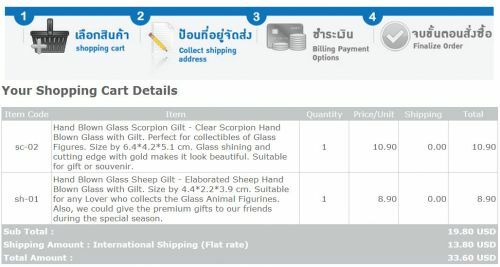 H. We will follow up and inform you the tracking number via an email within the two business days. Should you have any inquiry, please feel free to contact us back at info@weloveglassblown.com. 2) By using the e-mail. Please send your interest of the items and quantity to info@weloveglassblown.com Or weloveglassblown@gmail.com. We highly suggest the first way since it is convenient and faster. If you are not contacted within 2 business days after the cleared payment, please contact us either phone or e-mail. We will promptyly take care of you.